Hi everyone my name is Prudence.I was taken in by a lovely lady by the name of Anne and her husband, whom had been looking after me for a month, as I just wandered in on to their back verandah and stayed, and under the advisement of TNFO Inc. took me to the vet to have a health check and to see how old I might be, and the vet thinks I was approximately 3.2 years old at the time of examination, and a very healthy and desexed young girl, but no microchip so I don't know whom I belong to 😪 so TNFO Inc. took me on to find me a wonderful furever after home, and they did, and off to Sydney I went to live, but after trying everything for a month their, the family's furever after cat still didn't like me (also an ex foster cat from TNFO Inc.), so back to Queensland I came and hence I am back up for adoption now. 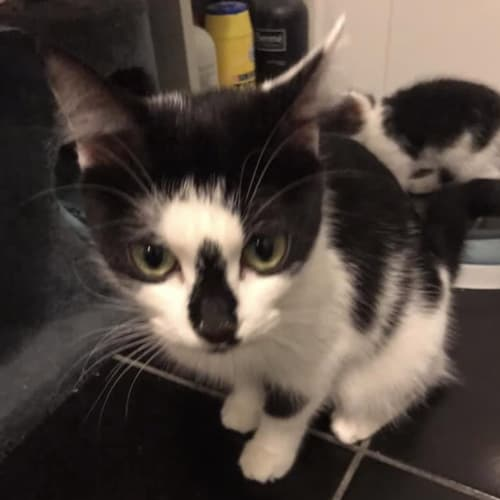 I am actually a tiny little scrap of a girl, and I am a very loving and friendly, and I just know I would love to be cuddled once I am part of a very loving family, but very shy of course.Date of Birth:- Approximately October 2014Litter Trained:- Yes.Dog Friendly:- Still very wary.Child Friendly:- Haven't been around little children for awhile.Cat Friendly:- Preferrably not.Location:- Springwood, Brisbane.I am available for sponsorship/virtual adoption until I find my safe and loving indoor furever after home. Mina is a sweet tabby & white shy girl who would enjoy a quiet indoor home. Once she realises you're not so scary, she is a little smooch and enjoys a pat. 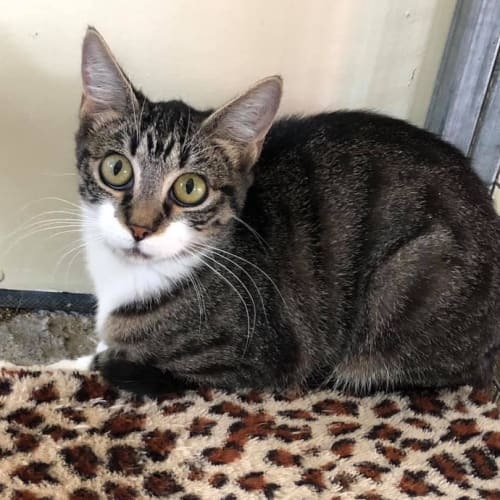 Hi everyone my name is Gracie and I am such a very sweet and bold young girl. I do get along well with other cats and dogs, but would prefer to be the only animal in your household. 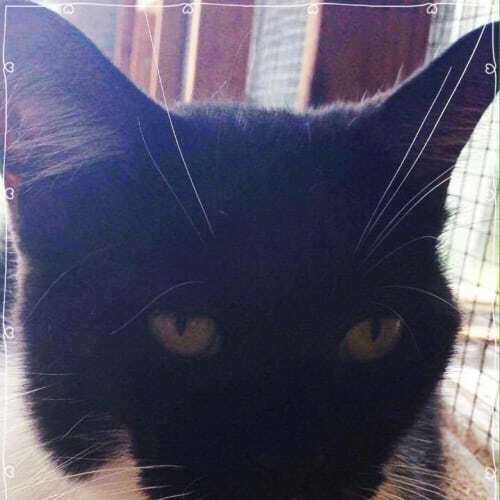 I am not a lap cat and want to only to be loved on my terms only, however still very loving when you get to know me.Date of Birth:- July 2012.Litter Trained:- Yes.Dog Friendly:- Not sure not been around dogs for quite some time.Child Friendly:- Preferably with children over the age of 12 years of age.Cat Friendly:- Yes, but would prefer to be the only fur baby in your household.Location:- Gold Coast.I am being sponsored/virtually adopted by the lovely Kate until I find my furever after home. 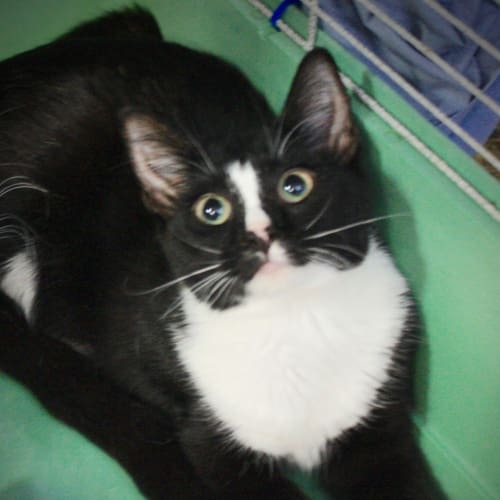 Bobby is a sweet and playful boy who is really starting to come out of his shell here at the refuge. When he first came in, Bobby was very unsure of some people but is now coming along in leaps and bounds with our staff and volunteers. Bobby would enjoy a home where he had plenty of attention and ideally another dog as a playmate to help burn off his energy. Bobby is very strong and will need a bit more training on a lead and learning not to pull. Bobby comes desexed, microchipped, registered with the local council, vet checked, up to date vaccinations and regularly wormed & flea’d. Hi everyone I am the lovely Worms. I am a wriggly little boy (hence why I am called Worms and for no other reason why), who just loves his human companions. I will follow you around everywhere and enjoy cuddle time, however I would be better suited to children over the age of 12 years old, because I do little love bites, but they can hurt sometimes. I get along with other cats and love my food. 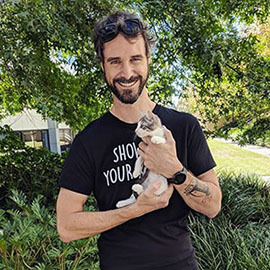 Are you after a cuddly loving companion? 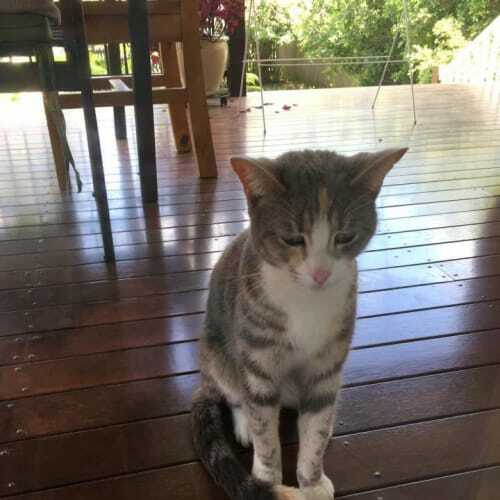 Date of Birth:- December 2015.Litter Trained:- Yes.Dog Friendly:- Not too sure as haven't been around dogs for quite sometime.Child Friendly:- Preferably with children over the age of 12 years of age.Cat Friendly:- Yes.Location:- Brisbane.I am being sponsored/virtually adopted by the lovely Karen Sa. until I find my furever after home. 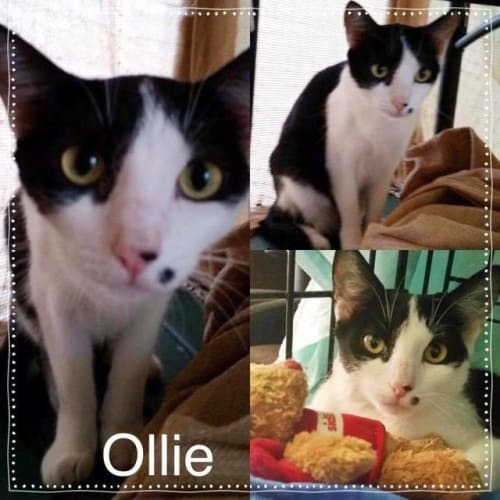 Hi everyone my name is Olli.I am a very shy little girl, but once I learn to trust you I will steal your heart. 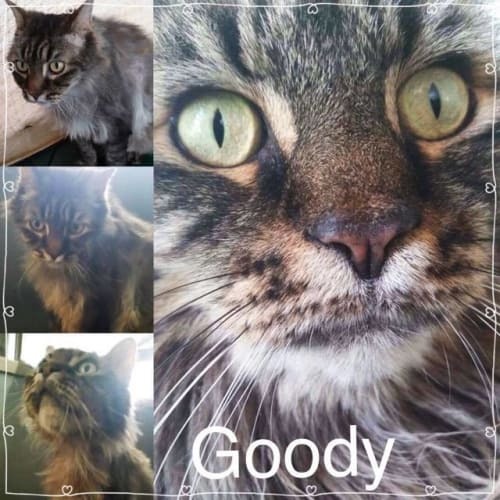 I love to play with all sorts of different toys and my boyfriend Goodi, whom I must be adopted with as a bonded pair. I was rescued from the streets on the Gold Coast after The Not Forgotten Ones Inc. had spent 2 months trying to trap my 2 brothers and I. I was quite easy to trap as I had a very badly broken leg from hip to foot and spent 7 weeks in hospital with our wonderful rescue vet, and 2 big operations later Dr Lance was able to not only save my leg, he also turned me from a wild, scared little girl to a wonderful loving little girl in the 7 weeks I was in hospital with him.Also I am only available for adoption with my boyfriend Goody.Date of Birth:- November 2015.Litter Trained:- Yes.Dog Friendly:- Not sure as have never been tested.Child Friendly:- Preferably with children over the age of 12 years of age.Cat Friendly:- Yes.Location:- Hervey Bay (however I can be brought down to Brisbane/Gold Coast for meets and greets on a weekend with prior arrangements having been made with TNFO Inc. Admin Team).I am available for sponsorship/virtual adoption until I find my furever after home. Hi everyone my name is Goody. I was rescued from a small beach town in Queensland. 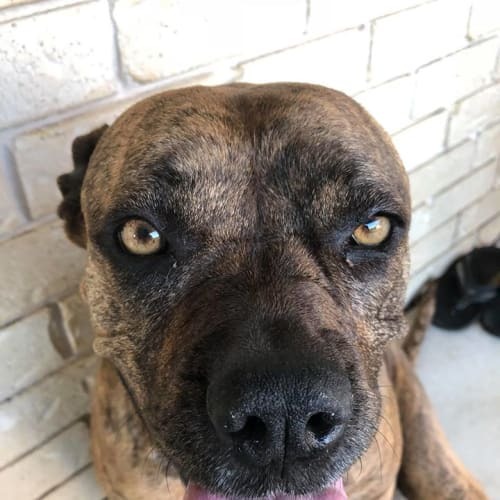 I am very loving but not in to being picked up and carried around but I will be your ever faithful companion and do love to come and sit beside you and patted and patted and patted. 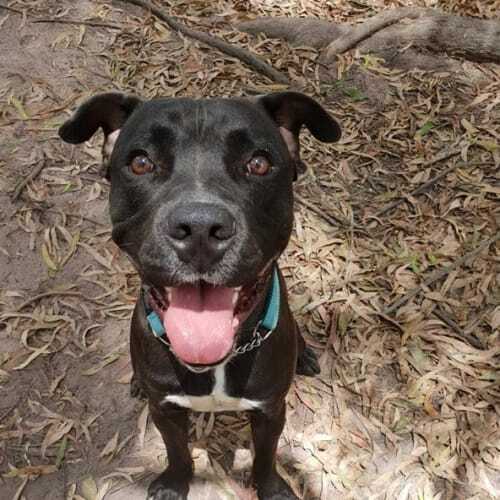 I come as a bonded pair with my girlfriend Olli so we will only be adopted together.Date of Birth:- October 2014.Litter Trained:- Yes.Dog Friendly:- Yes.Child Friendly:- Preferably with children over the age of 12 years of age.Cat Friendly:- Yes.Location:- Hervey Bay (however I can be brought down to Brisbane/Gold Coast for meets and greets on a weekend with prior arrangements having been made with TNFO Inc. Admin Team).I am available for sponsorship/virtual adoption until I find my furever after home with my girlfriend Olli. Hi everyone we are the gorgeous Maui & Boscoe!! 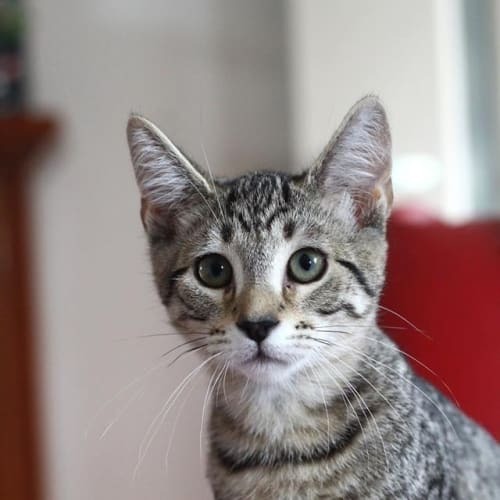 We are a bonded pair and need to go to our furever home together 😊I Maui, am a young tabby (whose picture doesn't depict my strikingly beautiful markings!!) I am a gentle girl, however is a little unsure of humans still . 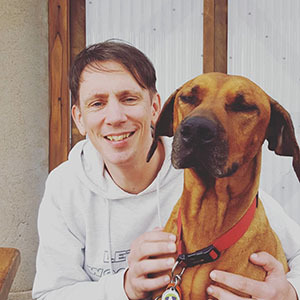 I do enjoy my head pats though lol - I can't help but feel that I would be a very loyal and faithful cat with the right human.Then there is my beautiful big boyfriend Bosco. He can't get enough of humans kisses & cuddles and the head butts are phenomenal lol .. We have really connected. 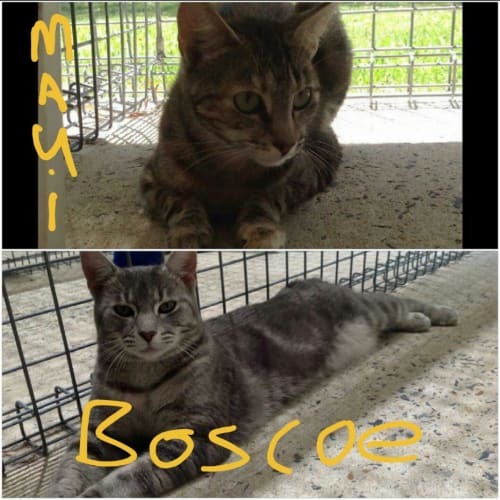 Maui truly admires Bosco and we know we would live quite nicely together 😊Date of Birth:- June 2015.Litter Trained:- Yes.Dog Friendly:- No (but just in the last week have been nose to nose with the temp foster carers 2 medium sized dogs through the enclosure so could quite possibly be ok with cat loving dogs with very slow introduction)Child Friendly:- Preferably with children over the age of 12 years of age.Cat Friendly:- Definitely not ONLY with each other.Location:- Have only just recently been moved to Brisbane.We are also available for sponsorship/virtual adoption until we find our furever after home together. 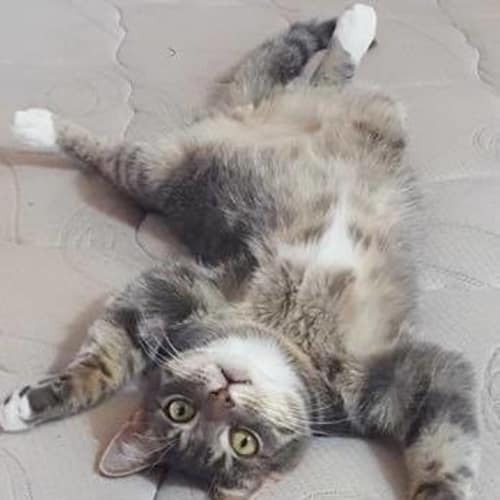 Hi everyone I am the gorgeous Patience and wrestling is my game! Although a little stubborn when it comes to new faces, I am quite possibly the bravest and most trusting kitten. A spitting image of my beautiful Mumma Boots, and I am really quite a stunning girl; and I certainly know it!I was rescued from the streets with my Mumma and 2 sisters, only just before Christmas 2016.DOB:- Approximately 13 October 2016.Litter Trained:- Yes.Dog Friendly:- Yes.Child Friendly:- Would be better with older children.Cat Friendly:- Yes.Location:- Hervey Bay (but can be brought down to Brisbane/Gold Coast on a weekend for meets and greets with prior arrangements having been made with TNFO Inc. Team. )I am available for sponsorship/virtual adoption until I find my furever after home.